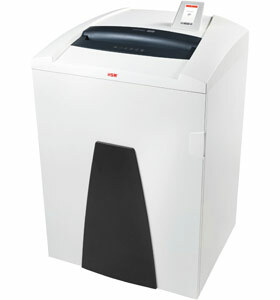 The HSM SECURIO P44i is an impressive 3.9x40mm Cross Cut document shredder and is the Highest Capacity Departmental Shredder on the market. With an innovative IntelligentDrive motor and a high-resolution touch screen display making it the perfect choice for large working groups and entire departments. The filling level of the large removable, reusable waste bag is displayed through an inspection window. This machine is manufactured in Germany. A unique feature of this machine is that it will shred USB sticks through the main cutter unit into 3.9x40mm pieces assuming that the USB is able to fit into the throat of the machine. The depth of the slot is 14.7mm which is fine for most 'normal' USB sticks. Please also note that whilst the machine can cope with plastic and aluminium bodies, USBs with a heavy steel alloy case or military spec drives could cause an issue and are not guaranteed to be destroyed and may damage the machine. In the Box As well as the shredder, power cable and product manual, the box contains a free 250ml starter bottle of shredder oil & a pack of 5 waste sacks. Please note that the shredder oil will last approximately 1 week and so it is recommended that you order more to keep your shredder running at full capacity.